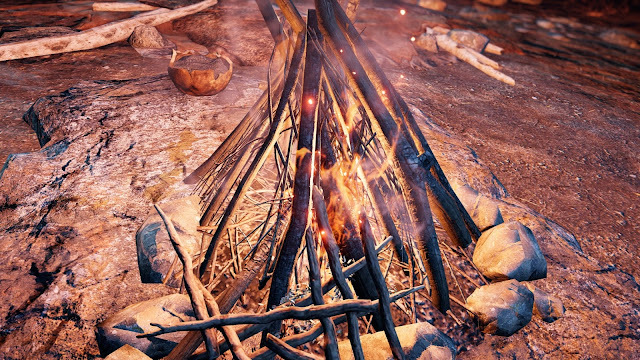 When we last spoke about Far Cry Primal, I mentioned that I had taken measures to make the game more immersive and difficult, in an attempt to better simulate the world in which the game takes place. Every developer diary described the land of Oros as dangerous and unforgiving, but the vanilla game give the player numerous outs and exceptions, including a minimap, reticle and a bomb dropping owl. Survival mode eliminates all of these things a more to create a truly harrowing stone age experience. While everyone is focused on The Division and Destiny, Primal has done more in this patch to change and improve the game's quality, it feels more like a mini expansion than a patch. This is what patches used to look like in the oft forgotten late 90's and early Oughts. The patch notes are extensive and filled with substantial changes that players will certainly notice, not just a bunch of under the hood fixes that mean little to the average player. The new Survival Mode is unforgiving, but incredibly rewarding for those who can best it. A number of players went the route I did and turned off most of the game's aids. Presumably, Ubisoft took note of all the players choosing a more difficult experience and tailored the new mode for us. Where before we could only remove a few HUD elements and turn up the general difficulty level, Survival mode tweaks almost every aspect of the game, things that the menu options previously didn't allow like speeding up the rate that weapons are consumed by fire. The biggest change in Survival Mode is the stamina bar. This bar depletes slowly through the day, depleting faster when running or fighting. Manual healing costs stamina, as does fast travel, in proportion to the distance. Stamina can only be regained by eating and/or sleeping. If your stamina drops too low, your movement speed slows and fast travel and manual healing is disabled. The beasties that you train throughout Primal also receive some tweaks. The health for almost all of them has been reduced, and upon death, the player must find and tame a new one. Legendary beasts like the Great Scar Bear, once dead, can never be found again. Your owl, once a feathered bomber has been reduced to a role of strictly watching from above. No more attacks or ludicrous bomb drops. Resources were already an important thing the seek out in Primal, as they are the source for all of your weapons and ammunition. 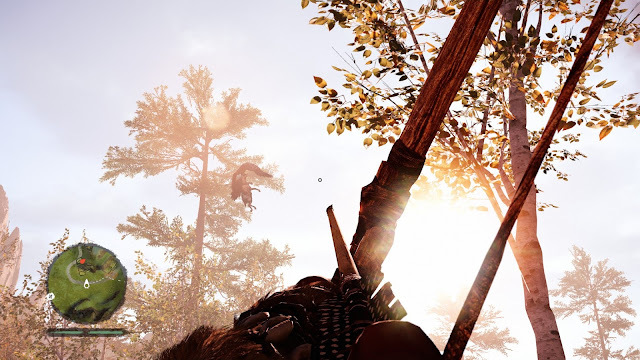 In Survival Mode, resources are more scarce, and without the aid of the minimap to help you spot them, players will need to be much more aware of their surroundings. To make matters even more desperate, several skill that aided in the procurement of resources have been completely removed from Survival Mode, due to being "overpowered," the nights have been made longer and darker, and the stash that players can access for resources from the village is only accessible from the village center. My favorite of the changes in Primal's new game mode is the option of permadeath. For those unfamiliar with the term, permadeath is a system whereby the player is not allowed to respawn where they left off. Instead, death means game over. No questions, no appeals, just game over. I haven't tried it out on my game yet but I can imagine how much it heightens the stress level of any given encounter. There would be no more running about into the middle of the enemy's camp for me, only careful planning and execution. I was so surprised to learn of the new game mode. I had no idea that it was happening until I started playing today to find a link to the patch notes on the main menu. Take a look at the full patch notes here for a full list of all the changes.